What to preach about today? Do I give you all a travelogue? As I was wondering aloud about this sermon, someone suggested I give you a top ten of everything we did and saw. We'll have many opportunities to talk about what we did and where we've been. You'll even probably get tired of me talking about it pretty darn quick. But the gospel pulls at me, and I can't just ignore it. And, as some of you know, Luke is my favorite gospel. So today, you get the gospel. Luke, the gospel writer of hospitality, tells us a story about Jesus who is going to the house of a leader of the Pharisees, who we affectionally consider the keepers of the Law, to eat, on the Sabbath, a day that is held in high esteem according to the Law, a day set apart from all other days. In the story that Luke is telling us, Jesus observes how the guests take their places, and in response, Jesus tells a story about an invitation to a very special meal, a wedding banquet. We have before us, a story within a story. So first of all, I want you to imagine yourself as one of the invited guests. What does that mean for you? Where do you sit? With whom do you sit? Is there ever a time you may think to yourself, surely not saying anything out loud, that person should not be here, that person is not distinguished enough, that person is not good enough, that person is not like me, that person should not be at this table. Jesus says, "give this person your place." Do not neglect to show hospitality to strangers, for by doing that some have entertained angels without knowing it. Now, I want you to imagine yourself as the one who does the inviting. When you give a luncheon or a dinner, do not invite your friends or your brothers or your relatives or rich neighbors, in case they may invite you in return, and you would be repaid. But when you give a banquet, invite the poor, the crippled, the lame and the blind. And you will be blessed, because they cannot repay you, for you will be repaid at the resurrection of the righteous. Remember, this parable is told in the context of a meal at the house of a leader of the Pharisees. You gotta believe the leader of the Pharisees have an agenda in inviting Jesus over, usually, they want to test him, they want to see what he's made of, they want to find out if he is righteous before the law. And so far, Jesus has failed miserably. He heals on the Sabbath, he eats with sinners and outcasts, and now, he's telling everyone in hearing distance not to invite the important people over for a meal, but invite those who cannot return the invitation. Who do we invite to come eat with us here at St. Andrew's? And when we invite them, do we actually encourage them to have something to eat, at this table and at the table in the parish hall. Do not neglect to show hospitality to strangers, for by doing that some have entertained angels without knowing it. And lastly, I want you to imagine the invitation itself. This is an invitation that we cannot pay back. Jesus invites each and every one of us to the table, and somehow, we are transformed in the eating. Somehow, we cannot leave the table without being changed. But it is not our own doing, it is indeed the love that wins, the love that blesses, that changes us. Do not neglect to show hospitality to strangers, for by doing that some have entertained angels without knowing it. You see, this story within a story from the gospel writer Luke, who is all about hospitality, gives us a picture of God's kingdom. What does the kingdom look like in this story? We need to back up for a moment, and remember something about 1st century mediterranean context. The greatest good was ones honor. Of course you sat at the head of the table, of course you expected those less than you to sit at the lowest place. Of course you invited the important people, the people who could do something for you, the people who had something you need. You would not have considered any other way. That's the way the world worked. It's really not so much different today. Jesus came into that context as Jesus comes into our context and says there is a new way, a way of God's kingdom. And in that kingdom, everyone has honor, everyone has status, and that is based on God's love, that is based on being created in God's image. It is not about who you are, it is not based on how much you have, it is not based on anything you can do. In God's kingdom, we are all related, and what we do matters. In God's kingdom it is love that wins and love that blesses. We are called to the same sort of hospitality, we are called to make the same sort of invitation, we are called to build this kingdom, where no one is an outcast, where all of us sinners are welcome. We are called to the table to feed and be fed. As we feed and are fed, we are sent into the world to be the heralds of this kingdom. We are sent into our work, and our school, we are sent into our communities, bearing this new reality. We are sent into the world to show hospitality to strangers, for by doing so we entertain angels. By doing so we are the agents of God's kingdom. By doing so we bring God's healing and reconciliation to all who are broken, which is each and every one of us. We are followers of Christ. We are invited to the table where there is no preference of place. We are invited to be builders of the kingdom. We are charged to engage every person with mercy and compassion, for by doing so, we entertain angels. 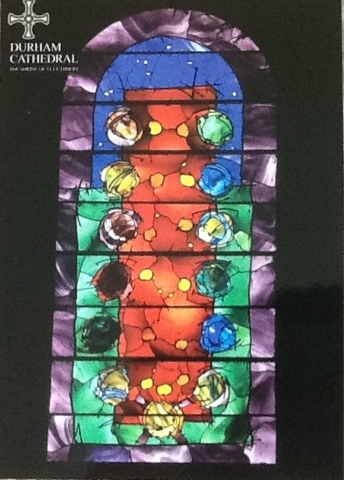 This is a picture of a stained glass window in the Durham Cathedral.